1950s England is in the grip of austerity, so Donald Finney is elated by a proposition of work, with a substantial reward. While the initial meeting regarding the job is somewhat odd, Finney never suspects anything sinister until it is far, far too late. When Finney’s body is discovered, with no clear cause of death but oddly discoloured, a note in his hand brings the case to the attention of Inspector Stire, but it is the various oddities of the case that bring in Inspector Andrew MacMorran and Anthony Lotherington Bathurst. Is Finney’s death linked to an earlier body, found elsewhere, but with similar discolouration? Where did he get the printed note with Inspector Stire’s name on it? And why was there some cooked bacon rind hidden in his belly-button? Sorry about the few days free of blog-posts – it’s been busy at work so reading time has been a real luxury. But what better to keep me reading that the author that I’ve all-but-rediscovered, Brian Flynn. Certainly, he’s an author that I’ve, unfortunately, helped to inflate the price of. 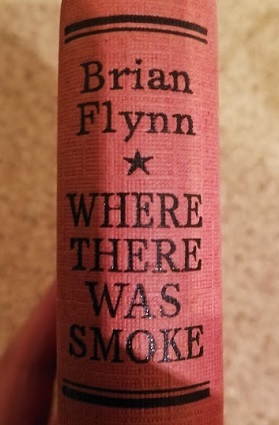 And this one is an extremely obscure title… I’ve only ever seen one copy for sale of When There Was Smoke, and thankfully, managed to procure it before anyone else noticed it for sale – or, at least, anyone who is versed in the way of Mr Flynn. But is it any good? It’s a late entry into his canon, coming in the same year as Black Agent and And Cauldron Bubble, two decent mysteries, but this has more in common with Conspiracy At Angel, plot-wise. It’s the story of a criminal conspiracy and the detection thereof. It has more in common with Croftian tales such as The Sea Mystery, being the tale of a sleuth uncovering the truth behind a mysterious crime. There’s no real whiff of whodunit, just a sense of what the hell is going on. But it’s a damn sight better that Conspiracy At Angel. It has some rather bonkers ideas in it. The Macguffin that motivates everything is exactly that, although it is sort of clued, and as with Conspiracy At Angel, very much a sign of the times, although not so much, as in that title, that it doesn’t make sense to modern eyes. The rationale behind the bacon rind… well, it actually makes a logical sense, I suppose, but a detective has as much chance of deducing the rationale behind it as, say, the “FACE” thing in Ellery Queen’s Face To Face. And when a mysterious person passes a hint to Anthony by spelling out an amazingly cryptic clue in a bowl of Alphabetti Spaghetti… well, that just won me over. The background theme of austerity is interesting, partly because I don’t recall Flynn bringing it up in the other books from the year. For example, when Bathurst’s breakfast is forced to be (honestly) “sausages and fishcakes”, one of his police colleagues, the highly entertainingly straight-talking Chatterton, offers him some black market bacon. Similarly, driving is something of a luxury, as petrol is in short supply.